I harbor no illusions that I am that Good Hostess. For one, my kitchen is usually in too much disarray to imagine high class entertaining at the drop of a hat. Oh well. I make these bars anyway, because they taste utterly sinful, but the recipe is entirely reasonable in my book. 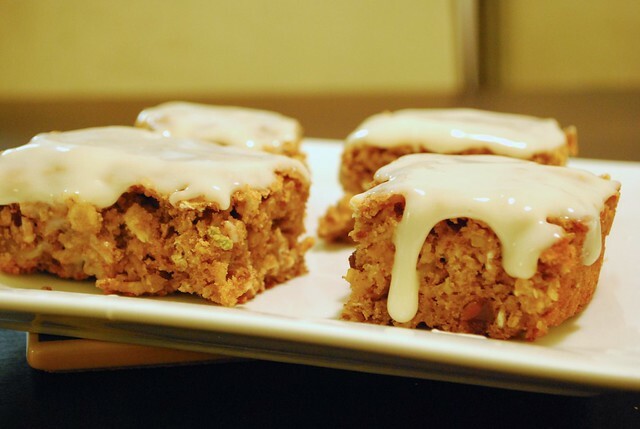 Compared to your usual carrot cake, the fat is cut back, and the flavor is amped up, making these a just right anytime treat. 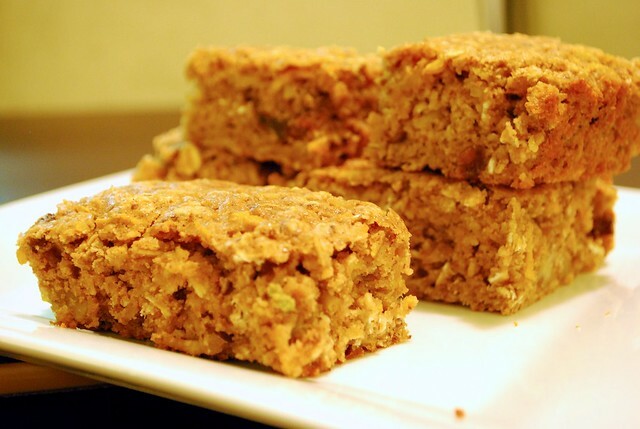 The carrot bars are dense, chewy, and moist. Sweetened with some New England maple syrup, the flavor is further heightened by nutty shredded coconut, chopped walnuts, and juicy raisins. The cream cheese glaze is what nudges them over-the-top, with a sweet tang that completes the package. 1. Preheat the oven to 350 degrees. Grease a 9″ round or 8″ square baking pan with cooking spray. 2. Mix the soy milk and lemon juice together and set aside; it will curdle into “buttermilk”. In a small food processor, or using a whisk, blend together the ground flaxseed and water; set the flax mixture aside to thicken. 3. Beat the margarine and maple syrup in a large mixing bowl. Add the soy milk, flax mixture, and vanilla. Beat well. 4. In a medium mixing bowl, combine oats, flour, cinnamon, salt, baking powder, and baking soda. Gradually add the the dry mixture into the wet ingredients, stirring until it is just blended. Fold in the coconut, walnuts, and raisins. 5. Bake for 30 minutes, or until a toothpick poked into the center comes out clean. Cool in pan on wire rack. Frost with cream cheese glaze once cooled, if desired. Beat the cream cheese and sugar together until light and fluffy. Chill until you are ready to frost the bars. This entry was posted in breakfast, dessert and tagged bar, carrot, coconut, dessert, maple, oat, raisin, recipe, vegan, walnut. Bookmark the permalink. If I was invited to your house and given these bars to eat, I would definitely think you were a good hostess! I just found your site via Foodgawker. AWESOME vegan recipe. I can’t wait for more yummy recipes. There aren’t that many vegan blogs out there that have good/interesting recipes. Thanks! These bars look sooo good! 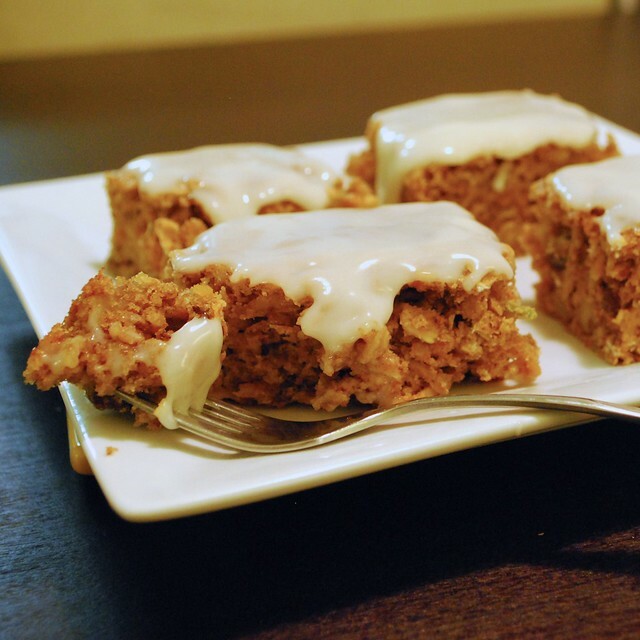 I love carrot cake and these sound like a healthier – but still tasty – version. I just posted a recipe for vegan carrot cake ice cream that would go great with these carrot maple oat bars! Fantastic! They look quite healthy, with the whole wheat flour. It reminds me of parsnip maple cookies, a recipe which is not yet vegan, but could be made to be so. Thanks for the inspiration. Hello, just to follow up and say that I thought my readers might like this, too, so I mentioned you in my weekly links round-up. Thanks for the inspiration. Thanks Sarah! I hope your readers enjoy! I love carrot cake and I love the flavor of maple. I need to try this recipe asap. Thanks for the inspiration!